The Obama administration allowed state governments to divert Medicaid payments from providers to third parties such as in-home personal care workers or to cover court-ordered wage holdings, child support orders, and other state-issued legal judgments. "The law provides that Medicaid providers must be paid directly and cannot have part of their payments diverted to third parties outside of a few very specific exceptions," Tim Hill, acting director for the Center for Medicaid and CHIP Services said in a statement. "This proposed rule is intended to ensure that providers receive their complete payment." The agency also believes that the rule violated a part of the Social Security Act that guarantees states can only make Medicaid payments to providers. Critics said home care workers often weren't aware that the deductions were being made. Tuesday's announcement would not prevent workers from joining unions, but it might make it harder for unions to collect dues. "Allowing unions to skim dues out of caregivers' Medicaid payments damages the integrity of this important program which should be used to benefit those in need, not well-funded political interests," Max Nelsen, director of labor policy at the Freedom Foundation, a conservative-leaning think tank, said in a statement. "The CMS proposal is likely to have a negative impact on unions more than any other party," said William Dombi, president of the National Association for Home Care and Hospice, who analyzed the Obama-era rule and found the administration allowed the exception because more home health providers were unionizing. 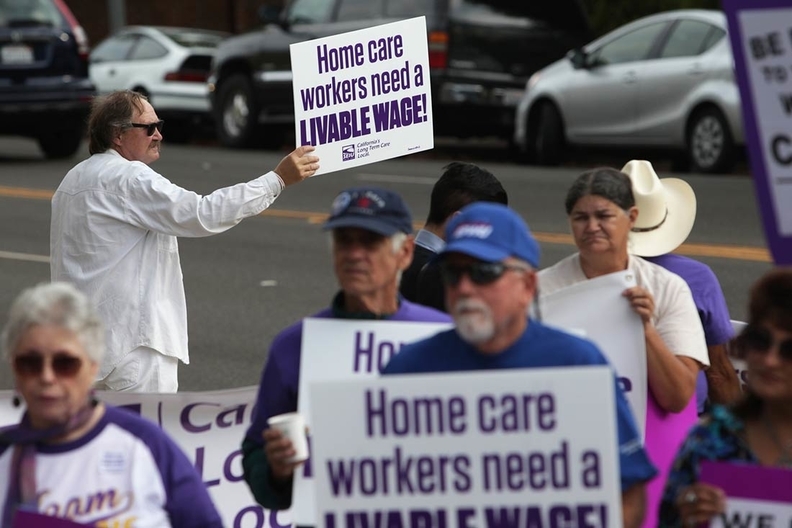 The CMS estimates that unions may currently collect as much as $71 million from Medicaid payments that are due to home health workers. "We are concerned that (the exception) is over broad," CMS officials said in the proposed rulemaking. "Therefore, the regulatory provision grants permissions that Congress has foreclosed, so we are proposing to remove the regulatory exception."